Carpet stretching is a common service that carpet cleaning companies offer as one of their service options. This repair is necessary when wrinkles and ripples are noticed on the carpet’s surface. This common installation defect is caused by carpet installers who do not use the proper tools for carpet installation, or move too quickly through the process. Acting immediately when these defects are noticed is recommended to prevent any further damage from occurring. If left for too long the carpet’s backing will crease, and may call for carpet replacement. Although, replacement is usually never required when minor defects appear. Carpet stretching is the best solution for these minor defects usually at a very low expense. In most cases, a qualified carpet cleaning technician will be able to perform this simple task at a competitive rate and in a timely fashion. The process consists of pulling up the ends of the flooring and stretching using a power-stretcher until the backing is taut. Once the carpet is tight, the tech will then cut the excess carpet and re-install it back in its place. 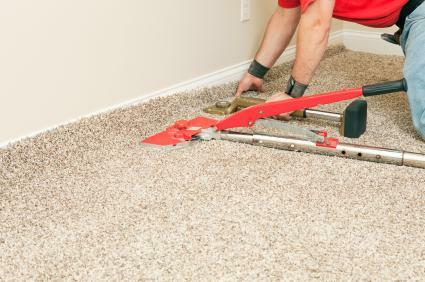 This process, when done properly will secure the carpeting preventing any future defects. The most important part of the entire process is the use of a power-stretcher. This tool is secured against the wall, a long pole attaches to the head of this device gripping the carpets backing. The repair technician then pumps a lever creating a mass amount of pressure against the ripples flattening the carpet back to its original state. A knee-kicker is then used to finish and re-attach the carpet over the tack-strips. When installers avoid the use of a power-stretcher, this typically is the source of the installation defect. A professional stretching job in most cases cannot be done with only a knee-kicker. It is always best to call a certified technician to perform these carpet repairs to ensure best results, and avoid possible injury or permanent damage to the carpeting when attempting to do it yourself. Benefits of carpet stretching will save you lots of time and money when compared to replacing you’re carpet. For any carpet stretching or repairs contact us at 951-787-8787 serving Riverside, CA and surrounding areas.